I know it's meant as a satire of communism, but I honestly was constantly chuckling to myself for the whole book. It's well written and I have to commend Orwell for shining some more light on how some will put themselves above others by using constant reminders of how they're better than them. 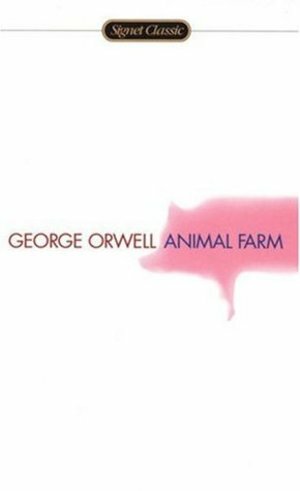 I've read Animal Farm in high school, I liked it then but the meaning was kind of lost because we didn't even learn about the Cold War, Russia or Stalin. Old Major (Karl Marx) gives a speech that inspires the animals to rebel against the owner of their farm and to take care of it themselves. The farm does very well at first, they come up with rules they will follow with the pigs, mostly Napoleon (Stalin) and Snowball (Trotsky) taking the lead and organizing. The animals are happy to work for the greater good of the farm and all are treated well with food and respect. Time goes on and Snowball and Napoleon cannot agree on anything. Napoleon chases Snowball off with his gang of dogs and becomes the only leader. He takes credit for ideas Snowball came up with and blames him for anything that goes wrong. Over time the pigs alter the rules and are being treated better than the rest of the animals, despite them not doing any work while the rest work hard. The animals think their life is still better now than what it was with Mr Jones and don't want him to come back. Years past and the pigs alter the biggest rule, 2 legs bad, 4 legs good, the pigs walk on two legs and the animals can no longer tell the pigs and humans apart. I definitely liked reading this more the 2nd time because I could understand it more and how it related to what was going on in the Soviet Union. Its amazing that a book like this even existed back then.